CounterPath, publishers of the Bria carrier grade softphone, has recently taken measures both to build their enterprise user base and to enhance the user experience when using Bria. Not only is Bria supported on Windows and Mac PC’s but also on the iPhone, iPad and Android. In other words, Bria provides a business desktop phone replacement with PC and mobile softphones that you can take with you when out of the office. And it’s targeted as a solution for enterprises upgrading to fully IP-based communications platforms. But these enterprises still rely, in many cases, on the carriers to recommend and install products and services. Building the enterprise user base: Two weeks ago Counterpath announced an agreement with GENBAND, a major carrier supplier of IP infrastructure and application solutions, to provide unified communications solutions for GENBAND’s Communications Application Server on mobile and tablet devices. Andy Abramson, at VoIP Watch, has given an outline of what this means to Counterpath’s participation in the “new” telecom technology market in his post CounterPath Gets Distribution. Today, the companies changing the game in getting new telecom technology to the market include Broadsoft, MetaSwitch and GENBAND. They each control the lion’s share of what gets to the telcos so eventually in a transparent way the technology gets to consumers, and to the business markets too. Understanding the channel is key to success of any telecom products or services company, for one reason. It’s called Go To Market (GTM) but really could mean Get to (the) Market, and without channel partners there are just too many carriers, mobile operators and service providers out there today to effectively get to and sell to all of them directly. Nortel’s CVAS business is the recognized leader in the Carrier VoIP space, having shipped more than 121 million Carrier VoIP and Multimedia ports, including over 10 million SIP lines to leading carriers globally. Nortel has consistently been ranked as the #1 Global Carrier VoIP and Softswitch leader since 2002. Nortel’s CVAS business has customer deployments in all continents with leading carriers and provides VoIP solutions to 80 percent of IDC’s worldwide listing of top 20 carriers (by revenue). The bottom line is that Counterpath is providing a window into how the tier 1 to tier 3 telcos are absorbing and implementing IP-based communications technology in a mobile platform world. The SILK codec is free and also performs very well compared to other similar codecs that are royalty bearing. I should point out that because Bria supports SILK does not mean Bria can interoperate with the Skype service directly. Of course Bria users can call Skype users via the PSTN. Basically Facebook (on the left) and Twitter (on the right) are setup as additional “accounts’ on Bria, connecting via an XMPP feed as a peer to SIP accounts supporting voice, instant messaging and video. 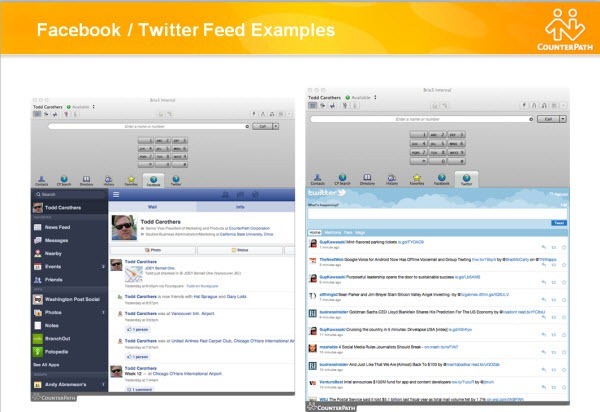 Bria becomes one more user interface option for accessing the user’s Facebook news feed and Twitter stream. Bottom line: CounterPath is making extensive progress as a vendor to the enterprise market through their partnerships with, and support of, market leading carrier vendors in the IP-communications solutions space. And they represent a market leading proxy for following the enterprise market adoption of IP-based communication solutions.